The PR Lawyer: How Can Lawyers Boost Their Avvo Ratings? As we discussed last week, Avvo is an attorney directory website that aims to “match consumers with the best possible fit for legal representation.” It also “rates” attorneys with a number from 1 (indicating “extreme caution” to 10 (Superb). What is in the ‘Secret Sauce’? Much like the formula for Coke or the 11 herbs and spices in Kentucky Fried Chicken’s seasoning, the precise factors that Avvo uses to calculate an attorney’s rating are kept secret. Avvo maintains that the information it uses is the same information displayed on an attorney’s profile. Whether you agree with the fundamental premise behind Avvo’s ratings or not, the site still probably has a profile for you. Because it appears so high in search engine results, we advise our clients to take control of their Avvo profiles and to fill them out as completely as possible. After years of experience helping clients improve their Avvo ratings, here are six areas of the Avvo profile that we have seen correlate to a higher overall rating. Attorney endorsements: We have found that endorsements from fellow attorneys significantly increase an attorney’s Avvo rating. However, there is a limit to how many endorsement points you can receive. To receive endorsements from your peers, you need to proactively request those testimonials. It’s the same as asking someone for a reference, and it is rare that other attorneys will endorse you without being formally asked first. Work experience: The Avvo Rating factors in the type of work experience as well as the number of years you have practiced law. This can include leadership positions that you have held with legal associations (e.g., state bar). And be sure to include your current employer. If your current employer is already listed on your Avvo profile, check to make sure that information is correct such as your employer’s address and contact information. Awards and honors: Awards from recognized groups such as Super Lawyers, The Best Lawyers in America, Martindale-Hubbell, etc. will positively impact your Avvo Rating. The weight from these awards will decrease over time, however, so be sure to update each year that you receive the award. 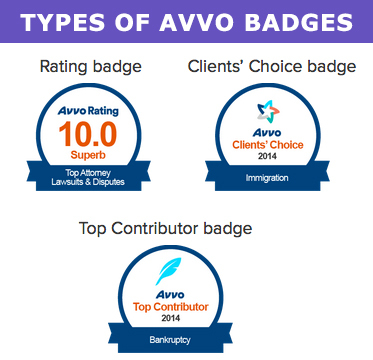 Associations: Avvo also is interested in your professional involvement in the legal community. This shows that you take your law practice seriously and that you are committed to improving yourself as an attorney. The boost to your rating will be even bigger if your peers have elevated you to an office or position within that group. Publications: If you have not published any articles, now is the time to do so. We highly recommend submitting an article in your area of expertise to a legal journal or other media outlet. If it is published, you will have a publication credit to add to your Avvo profile. If you already have published law-related articles, then you are ahead of the game; just list them on your profile. This is also a great place to include media mentions if you or your cases have garnered positive media coverage. Speaking engagements: Lastly, be sure to list prior speaking engagements. This can include events where you have given a talk, such as at the annual bar association conference, or if you have led any continuing legal education (CLE) programs. If you haven’t yet taught a CLE program, think about what expertise you have to offer. 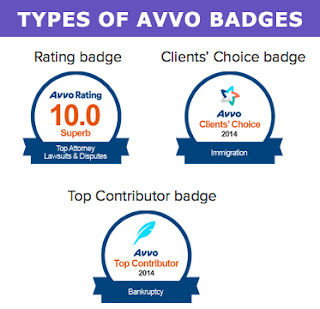 In addition to expanding your knowledge of your chosen practice area, it's a good way to increase your Avvo Rating. Has your Avvo Rating affected your business? Share any thoughts and/or experiences in the comments below.